Tension has been on the rise on the Korean Peninsula this month. Two South Korean border patrol troops were severely injured by landmines laid by North Korea earlier this month. South Korea responded by resuming propaganda broadcasts toward the North, and restricting travel to the Kaesong industrial complex. The inter-Korean tensions rose to another level when the U.S.-South Korea joint military exercise began. On August 20, the two Koreas exchanged artillery fire. And on August 21, North Korean leader Kim Jong-un mobilized his frontline troops to a wartime footing. The last time he resorted to similar acts of provocation was in 2013, when he declared a “state of war” against South Korea. Although there is a sense that Kim’s provocations are within the realm of predictable responses to the U.S.-South Korea joint military exercise, countries that have a stake in the stability of the Korean Peninsula continue to monitor the situation very carefully. Japan is no exception, with Prime Minister Shinzo Abe canceling his plan for a brief vacation and stay in Tokyo. In short, this situation is a reminder that North Korea continues to present a clear and present security concern for Japan, making it imperative that Japan’s Self-Defense Forces have a modernized, legal authorization to respond to the evolving crisis in a timely manner and cooperate effectively with U.S. forces to ensure the stability of the region. However, Japan’s opposition parties are behaving as if they were oblivious to the recent heightening of tensions. Rather, they continue to focus their arguments against the government-proposed security legislation on domestic factors. 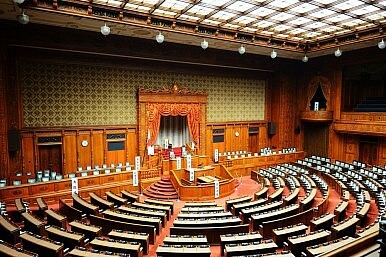 Most recently, they have been criticizing the government for allowing the JSDF to study potential changes to their operational guidelines with the enactment of proposed security legislation in mind. The opposition has decried the move as “presumptuous” and in contempt of due legislative process. In the Japanese Diet today, there are so many other things that the opposition parties could be questioning the government about. They could be asking how much the government knows about the situation on the Korean Peninsula. They could be asking whether the government is remaining in close contact with the U.S., Chinese, and South Korean governments so that Japan can effectively support Seoul’s effort to prevent further provocation by the North. The opposition could also be asking whether the government has a plan to evacuate the Japanese citizens living in South Korea— over 36,000 in total—should the situation take a turn for the worse. But the opposition parties are not doing that. Rather than pushing the government for more information that is relevant to Japan’s security today, they continue to choose to turn inward, focusing almost solely on the security legislation proposed by the Abe administration. While there may be justifiable grievances and criticism vis-à-vis the government’s approach to the security legislation, the opposition’s seeming indifference to the worsening security situation on the Korean Peninsula begs the question of whether their criticism is rooted in reality.